As you can see below I have posted a question concerning GCode in my introductory post. I guess I should have posted it here so please bear with me as I repost on this more-appropriate page. This is my first ever question and I hope to be able to help others with my inputs when I feel I have something useful to say. By way of introduction, I have a long history of Biomedical Engineering instrument design and manufacture (not using CNC machinery unfortunately) but, now that I'm fully retired, I'm slowly coming to grips with 3D printing. Am I the only person in the universe who is running a RAMPS 1.4 in an Anycubic Kossel Delta Plus Frame and who has run up against a brick wall trying to find the right combination of Marlin-Arduino Firmware which will allow me to run Dual Extruders for my new Cyclops Effector? It seems there are umpteen versions and combinations of Marlin and Arduino to be downloaded but I lack the ability to add Dual Extruders to my original (Chinese) Arduino program which otherwise works really well. I have fitted the extra motor to E1 and it runs when energised in one version of Marlin which supports Cyclops and Single nozzle extrusion, but for a different Board. I have been running the original, as-supplied, Firmware from Anycubic, with its very good Delta setting ability and other basic speed, direction, endstops, steps per rev., etc. The results 'out of the box' were really impressive. Now my ambition is to run the new Cyclops Effector, preferably with selectable E0 and E1 extruders, as well as maybe later doing some 'interdigitation' of the extruder steppers to make a quasi-mixing filament output. Maybe this already exists. This may seem pretty trivial to expert G-code programmers but I have spent uncounted hours trawling the internet, trying different combinations of Firmware tweaks, with no tangible results. Sad to say, the Marlin and Arduino forums are pretty unhelpful to those of us who are 'plodders' in this uncharted territory. I would be very grateful if some kind person could point me to some information on achieving this ability to modify the Firmware. Or maybe a clear tutorial? 'E1_STEP_PIN' was not declared. Finding my way through pin assignment is way out of my ability at the moment. On a more constructive note, I have fitted the magnetic effector plate for the Cyclops Effector and I have encountered several serious problems. This is far from being a good design. I will post a short description and some pix of my workarounds sometime soon. Thanks for reading this far and I look forward to being an active and useful contributor. Thanks for the tip. I'm new to this process so the first thing to learn is to ask questions in the right place. I think there must be lots of Kossel Delta owners wrestling with this problem. Hey Scintilla. welcome to the forums. I'd like to point out that while this is a forum for delta printers, it's one for the printers of a specific manufacturer primarily. So while we can try to help, this forum in general won't necessarily have lots of people with Kossel's. Additionally, you're saying Gcode (IE, the code that describes a part and the motions related to it), and asking about the firmware. Needless to say, knowing you're not looking for G-code could help with googling. I can potentially look into your issues, but If you can post your firmware files in the ramps section, that will speed us all up. Thanks for the helpful comments and for taking the time to respond. One of my misapprehensions is in thinking that Kossel is a generic term for all Delta type printers, in any event the Anycubic outfit refers to their printer as a Kossel Delta Plus (240mm dia, bed plate) and I have assumed that one size fits all. Obviously incorrect! I now appreciate the difference you pointed out between GCode and Firmware. I will try to be more specific and stick to the fact that I have little comprehension of Firmware and its possible pitfalls. As far as I can see there is very limited scope for adapting the Anycubic Firmware kinematics and the extruder driver(s) to do anything other than the basic functions. Opening up the many and varied versions of Arduino and Marlin, supposedly suitable for this printer, produces a large array of options, most of them being obscure and often incompatible with even the slightest change in settings. For example, changing the RAMPS 1.4 board setting to #34 EEB and the Extruders from 1 to 2 produces: 'E1_STEP_PIN' was not declared. Why is this so difficult? I'm not sure how to send a copy of the Firmware in question, other than to copy links to this Forum page. I don't want to upset any Forum protocols with long-winded script. Any guidance will be appreciated. I'm wondering if the Firmware you use on your printer, which looks a lot like it's a Delta, bears any resemblance to the Marlin-Arduino Firmware? I'm also wondering if there's an online tutorial for Firmware tyros so that I can reduce the number of dopey questions I need to pose? Just noticed on your map that you appear to be in Manhattan. I'm on the other side of the world in Melbourne, Australia. Kossel is a semi-generic name for a family of designs using an almost entirely aluminum extrusion frame to build a linear delta (There are also rotation, and extension/compression delta's, but those are more likely to see use in pick and place machines and "spider" robots). There are a few other families, such as the Rostock (the original one was built in Seattle, and is an older open source design, which SeemeCNC has been iterating on and improving), and the Cherry Pi, which was an attempt at a printer that used 90 degree angles between the towers, and firmware compensation of the kinematics models. If you say Kossel, or Delta for your printer, either is correct. We'll largely understand what you mean, so long as you don't accidentally use the trade name of another commercially available printer. Don't change the motherboard type, as the motherboard type that is listed determines the pin mapping used by the firmware, and several boards will connect different CPU pins to various functions. My printer is indeed a delta, but my firmware is VERY incompatible with a generic 8 bit board, having been written for an ethernet enabled 32 bit processor with more RAM than an 8 bit board has flash. There are some beginners guides to various firmware's. You might try looking at either the Marlin or Repetier firmware entries. There are other board/firmware families, such as Smoothieware (another 32 bit board), the reprap firmware that runs on the Duet, some RADDS, and Archim boards, and a few other more niche sets, like Replicape/Kamikaze. I'm definitely not in Manhattan. 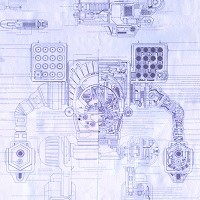 If the map you are referring to is the picture above my name, that's a schematic for a mech from a game called Battletech. I'm pretty solidly in the midwest region of America. Thanks for the comments and it's reassuring to know that I've been ( sort of ) on the right track with the changes. I had implemented them some time ago with resulting error messages such as: 'E1_STEP_PIN' was not declared and I have no idea where to go from here. To make matters worse, Arduino and Marlin files seem to morph, depending on which way the wind is blowing. Some suggested files are clearly intended for completely different boards and some tabs are either absent or don't contain the parameters I need to set for kinematics, temperatures, etc. I've tried completely unloading Arduino and Marlin files from my Win 10 64 bit PC ( surprisingly lengthy process I must say ) and reloaded the suggested files from the Anycubic website's page. I have read elsewhere that, surprise!, surprise!, I am not alone in my frustration and that several others have found the same level of confusion and malfunction. It seems that Anycubic has 'dropped the ball' with this so I must keep on plugging away in order to make it work. I think I will reload the latest Arduino and Marlin stuff and send screen shots of my screwed-up files to Anycubic's alleged support team and get them to try to sort out the mistakes, shortfalls and gaps in my technique. We shall see! Glad you're not in Manhattan, at least that part of the great city, which is, as I recall, pretty tacky waterfront real estate. My wife and I both love travelling in the USA and have been there several times. In fact we were married in a courthouse in Buffalo, N.Y. Happy Days! Our next trip might be next year, to revisit the S.W. deserts again. Fabulous! Your team seems to be really well organised.